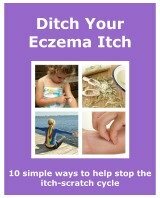 Having a red skin rash is one of the first signs you can see that tells you that all is not well with the eczema. It signals that a more severe outbreak is on its way. This is pretty helpful. It enables you to start treatment straight away, before the condition of your skin gets worse. A red skin rash is one of the signs of skin inflammation. This occurs because of the body's reaction to irritants. It starts when the immune system jumps into action. It sends out signals that 'an army' is needed to fight an infection and heal the skin. The army is made up of more white blood cells and anti-inflammatory substances. The white blood cells help to get rid of any infection. The anti-inflammatory substances start to heal the skin. There are some signs to look out for that indicate that your skin is inflamed. Redness of the skin is also known as erythema. The red skin rash is caused by an increased blood flow. Inflammation causes the blood vessels to widen. This increases the amount of blood going through them. Making the skin look more crimson. 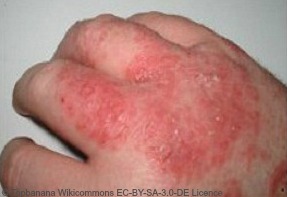 The severity of the redness of the skin changes frequently. Depending on different factors. It can be down to the environment you are in. Places that are fairly hot because of 'fake heat' are a problem. Sources of fake heat include central heating, electric heaters and hobs and ovens. These produce dry heat. And that’s exactly what it does to the skin. They dry it out, making it more itchy and redder in colour. You may have also noticed that if you are feeling stressed or upset the redness can become more noticeable. These factors can also make you what to scratch. The scratching increases the inflammation, so increasing the redness. Sometimes if my skin is looking more noticeable I feel more conscious about it. This doesn't help at all. It just gets me more stressed. So making my skin even worse. Though it probably isn't as noticeable as I think! Irritants in your environment can also be a problem. Contact with any of your triggers can cause an immediate reaction. On a daily basis I think we all tend to come into contact with something that can be problematic. When I do, I notice pretty much straight away the impact it has had. Redness is the first thing I see. Then the itching starts. I wash the area then apply some emollient, then some topical corticosteroids if needed. When the affected area has a red skin rash it is very likely to feel hot. The heat is also caused by the increased blood flow brought on through inflammation. As in redness, through the widening of the blood vessels. The rise in temperature can also make the skin feel itchy. If your skin is inflamed it is a good idea to keep it away from hot areas. These areas will make the skin even hotter, resulting in very itchy skin. When my skin is feeling hot I find it helps to run it under cold water. Then pat the skin dry and apply an emollient. Particularly helpful just before bed. The swelling of the skin can be caused again by the increased blood flow. The increased width of the blood vessels. This increased width can also result in a leakage of fluids. These fluids end up going between the damaged skin cells. The skin then becomes like a water-logged sponge. It looks and feels swollen. The excess fluid can collect and form blisters. At times if I have any swelling it can be tender to touch. Not painful, just a slight discomfort. All the symptoms of skin inflammation are easily treatable. A topical steroid is usually prescribed. It reduces the redness and swelling. This in turn helps with reducing the hotness of the skin. An emollient needs to be used at all times too. Leave 10-15 minutes between treatments. It allows the first one applied to be absorbed into the skin. Treating the skin inflammation before it gets worse or spreads is ideal. It normally doesn't take too long to improve. You also don’t want any further symptoms which may take longer to treat.